A typical scene back home(now seen only during vacation): It's 10.30 am in my house in Kerala and we are chatting around in the kitchen after the breakfast is cleared. The stomach is protesting from the hogging but Mom is already cutting veggies, assigning work to her helper B and discussing what to make for lunch. I just hover around, pretending to help while trying to take furtive notes....mom sometimes adds the magic ingredients when I turn my back....the kids are running underfoot and with their bellies full are for now appeased. With so many people at home on vacation, food dominates the day. Whether it's my house or my in-laws, it's almost the same scene. "What's for lunch?" "What's for dinner?" is as much a conversation piece as the latest news and movies. Plus the endless cravings will pepper the discussion resulting in a skewed menu, meeting every one's demands. Once back in the parents house on vacation, isn't it great to take a break from menu planning? No, I am not on vacation now, but was conjuring up home for a write up that Sailaja asked me to do. Once I started, it was like a time machine transporting me back!! Anyway, to continue, just as we speculate on the itinerary for the day, the fish of the day makes an entrance. Wrapped in a newspaper,(earth friendly packaging, anyone? )placed in a designated fish bag, it seems like it's still alive and flapping. My mom's trusty helper B takes over, gets comfortable in the work area of the kitchen and meticulously cleans the fish, attracting a slew of stray cats, mewing pitifully while patiently waiting for their share. The palm trees are swaying and there is a kind of peaceful swishing all around. The green itself is so soothing! Meanwhile, mom is busy in the kitchen, extracting tamarind paste, grinding ginger garlic and tossing some onions, green chilies, and spice powders into the clay pot. There is a constant chatter going on, sprinkled with a generous dose of gossip. The ingredients are all crushed together by hand instead of stirring with a spoon...it blends the flavors, she says. Soon the clay pots are bubbling away on the fire... and B has the fish washed and clean in the work area, ready for the curry. No sign of any yucky stuff now, and the fish/fishes are quickly separated into fry pieces, curry pieces and moliyar/molaku chaar pieces. All the curries are made simultaneously. Small quantities, daily cooking..is the mantra. When the mix in one claypot boils, the fish is added to it and when the fish is cooked, a fresh ground paste of coconut is added to it. (And if the fish is bad, you will know it the moment the fish hits the bubbling cauldron. It will stink up your kitchen!! )Seasoning is just curry leaves and shallots. That's it. 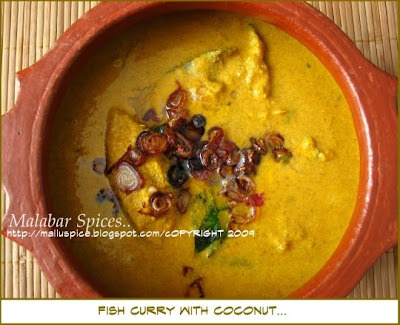 This is in direct contrast with the other fish curries which need slow frying of shallots or roasting the coconut etc. The other claypot has its own set of ingredients which will become the molaku chaar. And the fish pieces are marinated with chili powder, turmeric, ginger garlic and salt.. sometimes crushed shallots and curry leaves too are added to it. This coconut based curry is best with the middle pieces of the fish.. the most meaty ones... the yucky parts will hinder the delicate flavor of fresh coconut. The head and tail are more suited to the rustic molaku chaar/ red spicy fish curry. (Once only head and tails were bought from the fishmonger for a much relished Molaku chaar!!!) And every piece is suited for fry but mostly the meaty pieces are reserved for it. Ah! It's the weekend here so maybe I will replicate the scene in my kitchen. I will imagine the palm fronds and the lush green and try not to see the white blanket outside all around. Tamarind extract- 2 tsp or as extracted from a lime (small) sized ball. 1. Preparing the Fish: Clean and slice the fish. Wash it and toss with lime juice. 2. Dry Grind the ginger and garlic to a coarse paste. 3. Grind the coconut with the 1/2 cup water till it is a very fine paste. If you are using frozen coconut, make sure it is at room temperature before grinding to avoid clumping. Add water only as needed and not all together. When you think it's done grinding, grind some more to make it superfine. You could use coconut milk as a substitute. 4. Put the sliced onions, green chilies, ginger garlic paste, fenugreek seeds, the red chili powder, turmeric, coriander powder and the tamarind extract into the cooking saute pan or clay pot. If using tamarind extract, add 1 cup water. Crush everything in the pot by hand and mix well. 5. Adjust the sourness and add salt as required. Place this pot with the mix in it on the stove and when it is boiling, slide the fish pieces gently into the pan. Let it cook for 5 minutes without stirring. Add the ground coconut. If the ground coconut is a thick paste, add 1 cup water to it, else omit additional water. The water content is a matter of experience so add water slowly. Reduce heat to a simmer and cover and let it cook for about 5-8 minutes. Do not stir with a spoon. Just hold the pan on the sides by the mittens and shake the pan to mix well. Remove from flame and keep covered. 6. Seasoning: Heat the coconut oil in a pan and sauté sliced shallots and curry leaves till slightly brown. Pour over the prepared curry. Serve with rice or with triangular paratha. I just love anything with fish and offlate been experimenting with kerala dishes too...thanks will try this for sure!!! Wish i had this fish currt today for my lunch. I am drooling here, why was i not living next to you, then i could have had this with plain rice, the thought makes me drool drool drool. Poonam, do try but make sure you are making this with a fresh fish as the old/ or very frozen fishes will give out water and change the taste. Varsha, not a break, just a memory or a break!! Shn, I will come with you..lets go together!! Ann, thanks!! what fish do u use? U don't fry the masalas? Ki.. all the weekday stuff becomes so exotic once u are an nri. :))yeah sunday lunches are the only family lunch time left. my mouth is watering, yummy with some hot rice! what a yummy write up..we usually preapre this fish curry..I simply love it..
i have never prepared fish this way wanted to write here after making it. as usual, that is taking long. will this be good with salmon? Mothers with secret ingredients - they are everywhere! And now I want one of those claypots...wow, households have them in multiple numbers! You think they might be available in Chennai? i made this curry and it was a hit at my home. to be frank my fish curry is usually a flop show and i decided to try this recipe as my last attempt to making it. thanks. u made my day. i was so happy to see the smiles on my kids and husband's faces. have to try u r biriyani recipes to try and perfect that also. Love the picture, Shaheen! I don't eat fish but that masala sounds and looks great. Will use it sometime in a dish for sure! shaheen, just wanted to tell u that i finally made this. used catfish fillets. came out great! thanks! I tried this out and everybody around here loved it so much ;)!! thnks for opsting the reicpe! Hi ,It was a nice one...and a good snap of the dish....But You have missed two things in the recipe,where have you used the oil in the first time and also fenugreek seeds.its bit confusing...Anyway I think this Fish curry will be so yummy..thanks for sharing the recipe!!!! Ian , Shams, thanks for making it and a bigger thanks for letting me know how it turned out. I just got a comment on stuff i missed out so i hope u understood the recipe easily. Nish, thanks for pointing out the errors. i have corrected it. There is no oil in the beginning, just everything mixed with tamarind extract and the fenugreek is added along with all the other spices. Oh how simple but truly with a personal touch ? I love the crushing with your hand part. Our cuisines have more personal feelins just by touching and measuring ingredients with fingers. I am in love with this Curry dear! And your xplanation on th kitchen scene it was simply superb! I tried this at home! It came very well! It was my first attempt in making fish curry with coconut. I added a few pieces of tomato as well reducing the amount of tamarind. Thanks for the wonderfully write-up ; it truly evokes nostalgia ! Your recipe is great . Could you also please indicate the approximate combined weight of the six pieces of fish that you would normally use - it is not clear what size the pieces should be . deepa, the weight of the fish.. is a bit less than 1 pound.. one small pompano or perch i would say.. 4-6 small 1centimeter thick pieces slices of fish.